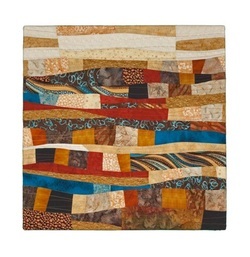 purchased the quilts! Check below to see what each sold for at the May 1st GALA & AUCTION in Waterloo. Following a trip to South Africa recently, I was left feeling sad as I watched the people living in poverty going about daily life (many seemed happy). I was told by a guide that the clothing these people wear (which we in Canada donate) must be purchased .Indeed the clothes are re-sold several times before touching the back of a needy person. Even then they pay. I am happy to make my small contribution to help improve the lives of the less fortunate. Russian punch needlework. In the summer of 2011, I traveled to Africa (Uganda) on a mission trip. I was overwhelmed by the great distances women traveled by foot. 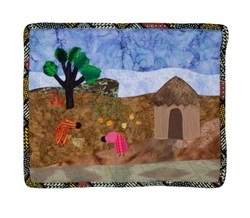 They travel for their basic family needs; food, water, education and to worship. By simply putting one foot in front of the other, they remind us that our daily journeys are something to be thankful for. The first inspiration was the fabric in the windows which has a wonderful community feeling. The shades followed as the piece grew. 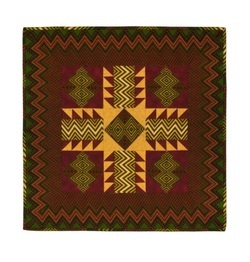 African baskets, woven from dried grasses, are unique works of art. 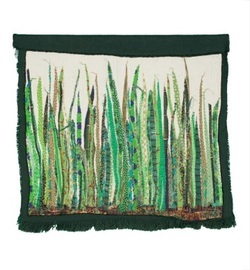 This wall hanging depicts grasses, some dark and mature, others pale and ripening, woven together with hundreds of hand stitches. Metaphorically presented are the lives of grandmothers and orphaned grandchildren held together by the deceased victims of the pandemic. To all of them I dedicate this work. and a vivid imagination. My birthday is in May and I will be 91.
grandmothers, it will be my way of counting my blessings. Although we are separated by thousands of miles and may never meet – we see the strength and love of African grandmothers. They inspire us. We see you . 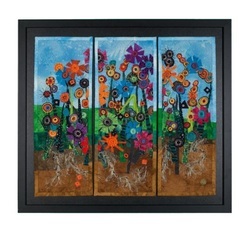 Flowers start from a seed buried deep in the soil, hidden from the cold and turbulent weather. Soft rain sends goodness and sun cuddles them as they sprout strong stems, blossoming, casting beautiful colour over the land. The flowers signify the African children. Small Children escape into themselves burying the ugly suffering they have to endure. Caring grandmothers coming forward: through resilience and determination they provide nourishment and love to the children's bodies and souls, allowing them to blossom above the ugly past and helping them to create a vibrant future full of compassion and hope. Hope rises! "Hope is a star that shines in the night…and none shall be afraid." 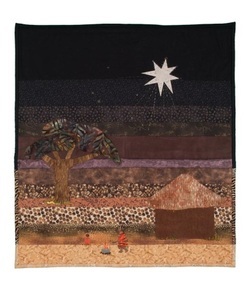 This advent hymn came into my sewing room while I was contemplating this project, and refused to leave. So I have tried to use it to express my own aspiration that the strong sense of purpose and determination that we have seen growing in our African sisters will continue to guide them forward to a new reality, a life for themselves and their grandchildren that is a new dawn beyond the HIV/AIDS pandemic. Inspiration came from a book published by the Glacier Grannies Group in B.C. 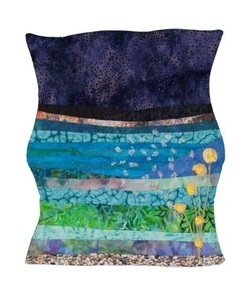 of 40 fibre art wall hangings donated by the North Island Quilters for Community Awareness. 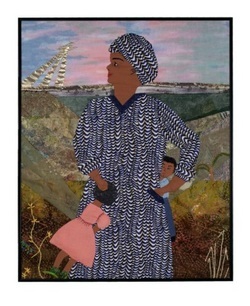 "A New Day is Dawning" shows a grandmother and a grandchild off at sunrise to secure water and other necessities for the day. 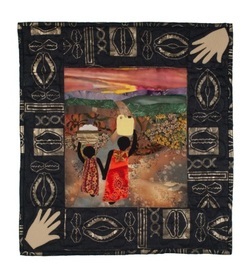 The helping hands in the border represent grandmothers through SLF, who are assisting African grandmothers raising their orphaned grandchildren. The grandmother and grandchild are holding hands signifying the help they must give each other in order to survive. The imagery symbolizes the growth of understanding and hope. Ferns break through the ground every spring, curled up into tight balls. Once above ground, and with the nurturing of soil, sun, and water, they unfurl and grace the world. Since all our lives on this planet are interconnected, we can only survive in the long term with a fair sharing of resources. We wish to send to the Grandmothers and those they nurture, the hope to carry on, to know that the children they raise will unfurl and grow like our small ferns. 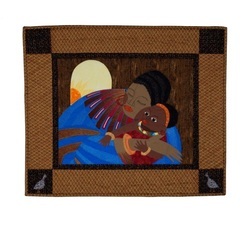 In this piece, I have tried to portray the love that extends from Grandmother to Grandchild. The "connection" is profound, and difficult to put into words. We Grandmothers, all over the world, applaud those in Africa who have accepted and risen to the challenge, in support of their precious Grandchildren. It is truly an honour to stand in solidarity alongside them. I hope they feel our strength and love. Snowdrops. 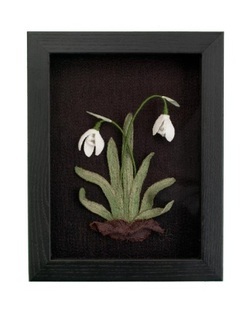 Galanthus nivalis, the first flower of spring in our part of the world, symbolize hope. These resilient blossoms poke their delicate heads through layers of fallen leaves and crusted snow as soon as the sun starts to warm the cold earth. Despite setbacks of heavy spring snowfalls, sleet and freezing rain, they persevere to remind us that more favourable, life-supporting times will come. 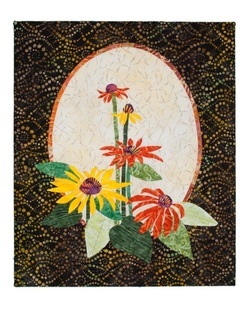 These blossoms are created using a technique I call Modern Stumpwork. I combine the modern technology of free-motion long arm machine stitching with the 16th century dimensional hand-embroidery technique known as Stumpwork. Courageous African grandmothers are showing the world that they will not surrender in the face of seemingly insurmountable obstacles. Their hope for a better future is a driving force that energizes them as they nurture their grandchildren and lobby for change. The issues with which they are dealing are complex, yet they are finding ways, both individually and collectively to make a difference. I wonder if I could be as strong, and both applaud and support them in their struggle. I am always inspired by the beauty of nature and my love of colour. Each spring my garden begins to emerge to dazzle me with colour and beauty. 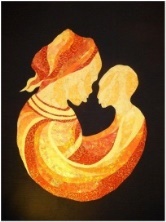 I have tried to capture that in this fibre art piece and show how it represents the roots of Africa---the unseen grandmothers---who took up the challenge to raise their orphaned grandchildren. These children will now have a chance to grow and create a new future for Africa. I wanted to represent that Canadian women have provided hope to grandmothers struggling to raise their grandchildren. The base area contains friendship blocks in Canadian colours to suggest the support given. This friendship provides a basis for hope. 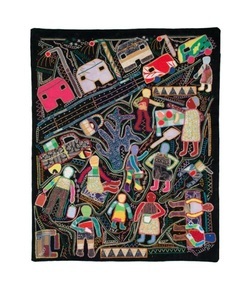 The three female figures represent a grandmother, a child and a daughter whose generation is threatened by AIDS. The dancing women dressed in colourful garments are celebrating their hope for a better future. The butterflies rising and hovering at the top suggest hopefulness provided by the financial contributions and anti-viral drugs helping to save lives. 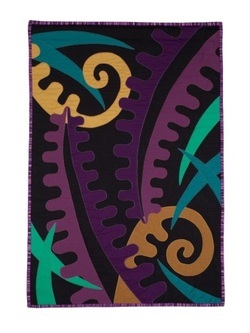 Some of the fabrics are from Africa. My inspiration comes from the crested guinea fowl, a bird found throughout much of sub-Saharan Africa. In African folklore it is known as the bird of protection and is symbolic of the human effort at survival. One turn of phrase translates as "I am running like a guinea fowl making an effort ". Grandmothers in Africa have taken on the same role in protecting and raising their grandchildren, safeguarding them from the potential pitfalls of the AIDS pandemic and making the effort to ensure they are clothed, fed, educated, housed and most importantly loved. How vital the protectors have become. 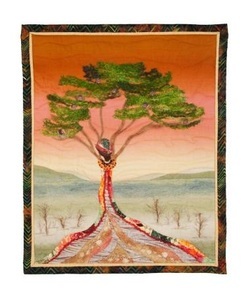 Inspired by my great admiration for Africa’s grandmothers, Rooted in Spirit expresses my vision of a grandmother as Acacia tree, a maternal symbol of protection, provider and link to the past. Often standing alone, she is tall, strong, resilient and full of grace. 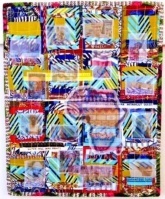 She is firmly rooted in the present as she raises her arms[tree limbs} to embrace her grandchildren while deeply connected to the sleeping souls [in the roots below] of her adult children lost to the AIDS pandemic. She is caring, full of hope for the future and deeply rooted in spirit. SLF "Grassroots", summer 2009 had a story about a 96 year old grandmother from Malawi, who was caring for four orphaned grandchildren in a hut with a mud floor and a leaky roof. SFL sponsored "HOFE" (hope for the elderly) repaired her roof and helped her with food. She had a home that could be repaired. Many sub-Saharan African women lose their homes when their husband dies. If a grandmother has a home and an area to grow food, she can better care for, raise, even educate her grandchildren. They can go from starving to thriving. Since my first trip to Africa in 1967, I have remained humbled and awed by the stamina and determination of African women who care for their families despite hardship, sorrow and moments of joy. Wherever I worked, I witnessed women carrying pots on their heads, along dusty roadways and up and down relentless hills, to fetch the precious water they required for washing bodies and clothes and for drinking. Backbreaking work, often surrounded by breathtaking natural beauty of the country side. A salute to women, particularly grandmothers, the backbone of their nations and their ongoing search for clean water. I discovered this fabric while rooting through a storage box for something else. The figures immediately reminded me of African Grandmothers. They struggle for everything, walk for water, carry food, care for their grandchildren, yet they are happy. They love to sing and dance and I am sure that this makes their toils easier. 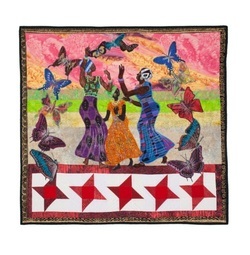 I dedicate this piece to the Grandmothers who discover joy through dancing. 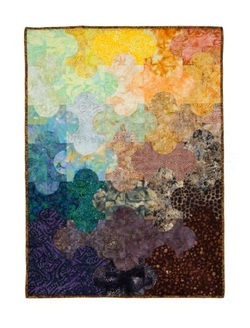 This quilt was inspired by the traditional quilt block Grandmother’s Dream. 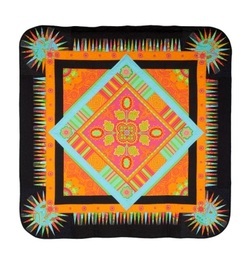 This nine patch pattern is enlarged because grandmothers do dream big! A little bling is needed because all grandmothers have a sparkle and their eyes when it comes to their grandchildren. 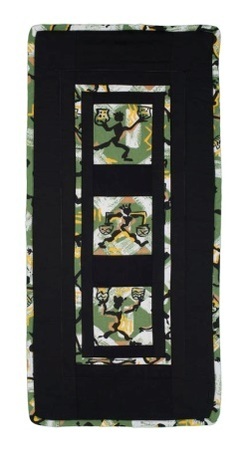 The fabric is from Africa and came from my mother’s stash of travelling purchases. Dandelions embody many of the same qualities that African and Canadian grandmothers possess. All are beautiful, playful and deeply committed to grow wherever they land. Grandmothers, like dandelions, are hardy and strong with deep roots. Both are bright, playful, and at times a little bit out of control. Sadly, there are times when both are dismissed or ignored. In Canada, as dandelions begin to emerge from the winter’s ground, we find hope that spring is on its way and that the long winter is behind us for another year. Hope, renewal and new life are present in grandmothers and dandelions. I hope that this piece of art reflects and celebrates these ideas. 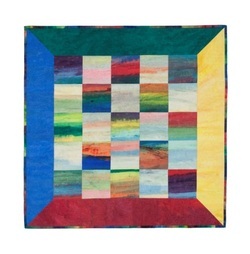 Caring Connection is a small group of ladies who meet monthly at Creative Sisters Quilt Studio in Kitchener to create quilts for charitable causes. 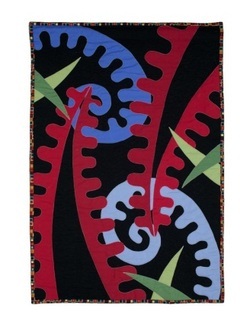 This donated panel of Michael Miller Fabric suggested a celebration of form and colour in much warmer climates than ours, hence, the title “ Medallion Fiesta”. 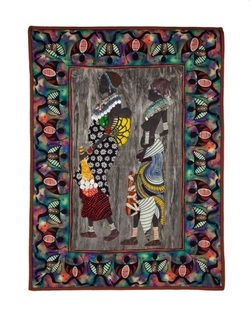 Medium: The grandmother is painted with ink on cotton fabric. 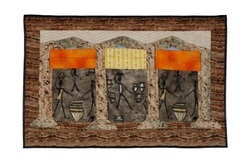 The detail and background are thread painted and thread sketched. It is fascinating how every horizontal line suggests the horizon! As we have just returned from Africa, we saw how the skyline ties us all together, even though the light might differ. The “Found Horizon” is the edge of the earth we all stand on together. Hand painted cotton, machine pieced and quilted. When the South African pension cheques come in the whole community gets busy! 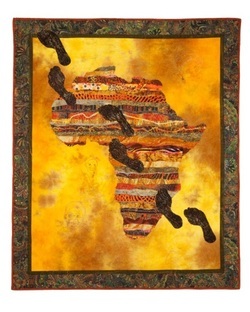 I purchased this piece in the Drakensberg Mountains, South Africa. 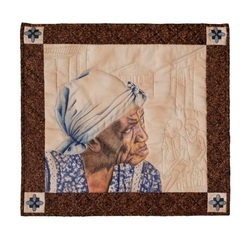 Dudu Malinga is a grandmother supporting grandchildren with her stitching. 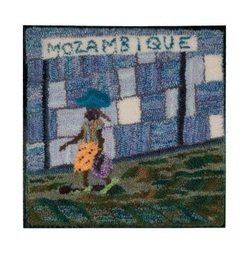 She is a member of the Isipethu Stitchery Group .